With a few notable exceptions, much of the fossil record of past animal life consists of only hard parts ---- jaws, teeth, shells, bones. In the case of many fossil vertebrates, skeletons may be diagnostically different but incomplete, sometimes woefully so. Given a good enough skeleton, or enough partial remains, a complete reconstruction of the skeleton can be undertaken. That’s often as far as it goes for paleontologists. Fleshing out those bones and bringing the dead, and the environment they lived in, back to life falls to those talented artists who specialize in paleontological art. I’m not talking about scientific illustration, which serves technical publications by carefully and accurately showing anatomical details. Rather these paleoartists, working in close collaboration with paleontologists, restore the past denizens of our planet in their full glory. Their awesome talents leave us with our most striking visions of those long lost worlds. The Cretaceous mammal Repenomamus robustus carrying off a young dinosaur. 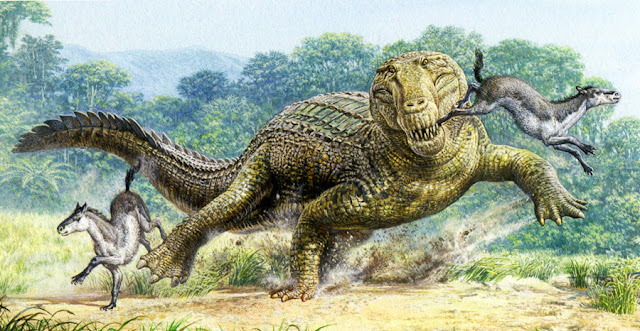 Fossils of this mammal have been found with the bones of its last meal, hatchling Psittacosaurus dinosaurs, preserved in its stomach area (artist: Julius Csotonyi). In the late Cretaceous of Asia a Tarbosaurus invites two Gallimimus to brunch (artist: John Conway). Dinosaur Art: The World’s Greatest PaleoArt is a sumptuous book, a visual treat featuring numerous pieces by 10 of the world’s leading practitioners of these dark arts. It is oversized, allowing for large size reproductions which makes the pieces really shine. The cover art, by Raul Martin, showing the giant Cretaceous crocodilian Deinosuchus preparing to dine on a tyannosaurid Albertosaurus, is one of the most striking pieces of paleoart I have ever seen. It is dramatic, powerful, realistic, and certainly draws one’s attention to the book. I don’t see how one cannot fail but to open this volume after seeing the cover. Given the very large number of beautiful illustrations and the very high quality of those reproductions the $34.95 price is quite reasonable. The remarkable large, horned, South American predatory dinosaur Carnotaurus sastrei (artist: Luis Rey). Gone are the days of a restored dinosaur standing still on a blank background. 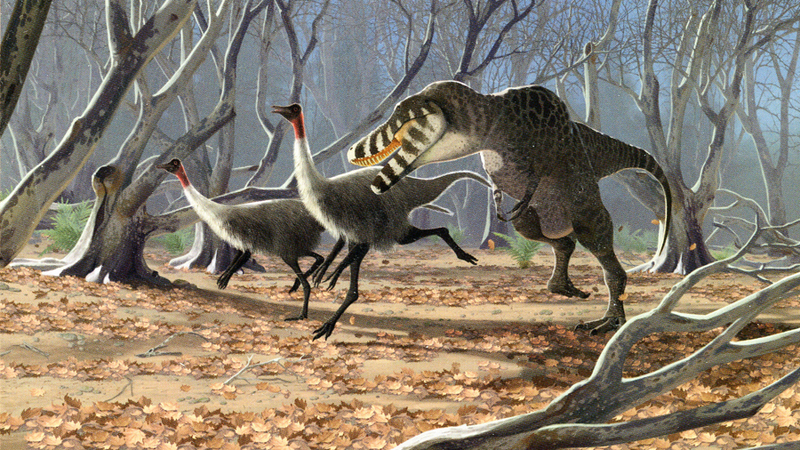 Modern paleoartists often recreate not just the animal but the total environment it lived in, frequently in spectacular detail. The scene is sometimes shown from an intriguing angle, a lizard’s view looking up at a massive sauropod dinosaur or a pterosaur’s view of a dinosaur herd as it soars effortlessly above the behemoths. 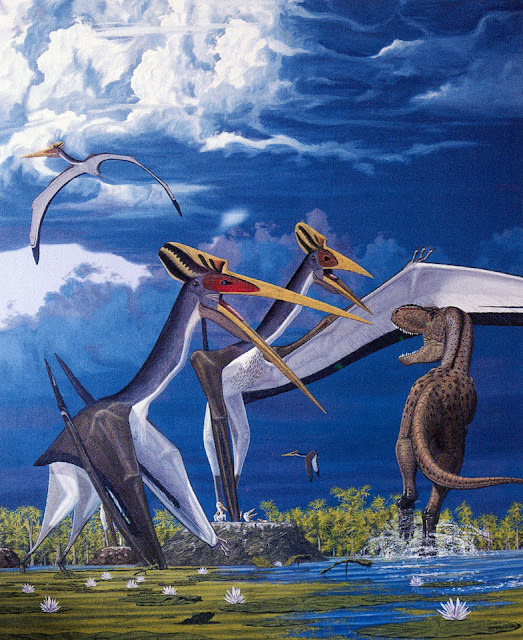 Modern paleoartists use a wide range of media. Acrylics, oils, pencil, ink, digital, and digital and photographic combinations are used to render powerful and dynamic images. Some are so detailed and realistic that they seem to be photographs of living animals. Leedsichthys, a whale sized filter-feeding fish of the Mesozoic ocean (artist: Robert Nicholls). 360 million years ago, giant eurypterid sea scorpions (Pterygodus), swim above the sea floor of New York (artist: Doug Henderson). 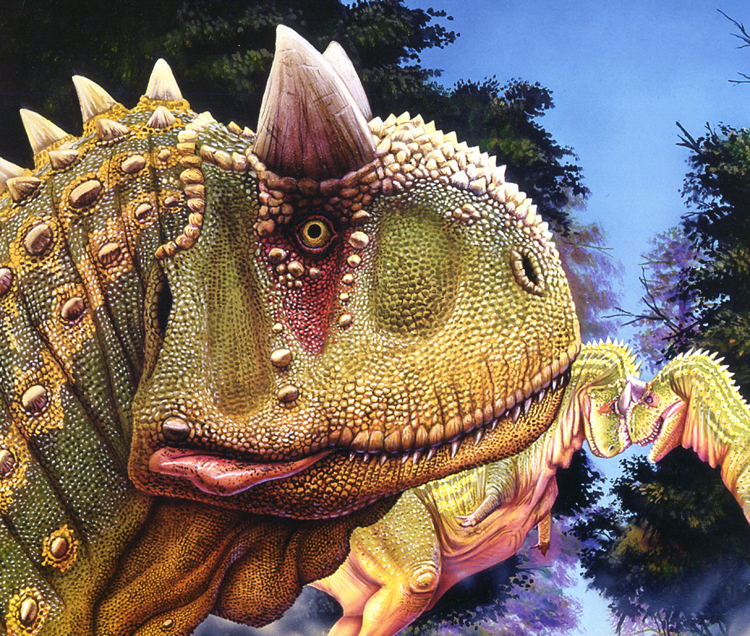 Each chapter in Dinosaur Art highlights a single artist. In addition to showcasing the artwork there is an interview with each artist that provides insight into how they became interested in paleoart, their approaches and techniques, which media they prefer and why, their inspirations, and many other fascinating details about these necromancers. 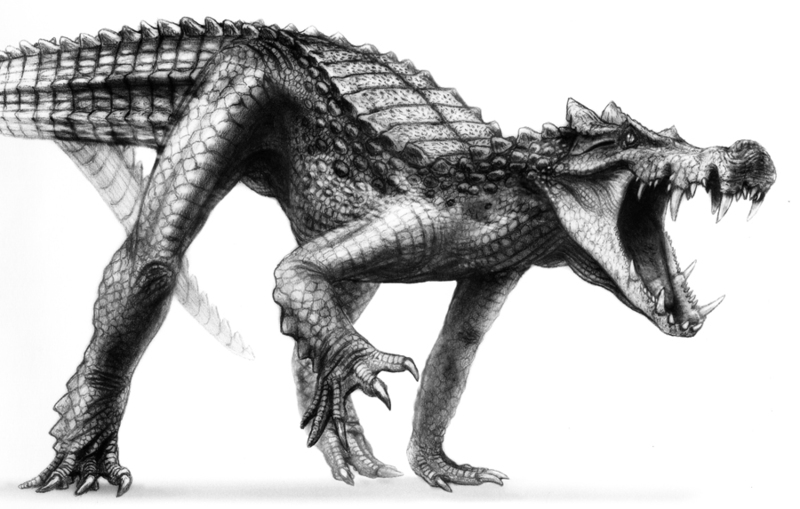 The long legged, running crocodilian Kaprosuchus saharicus, from the Late Cretaceous of Niger (artist: Todd Marshall). 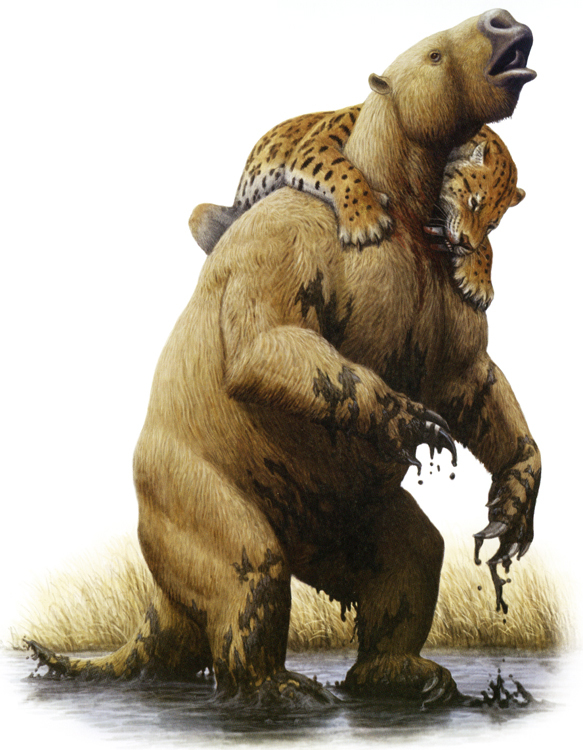 Bad day at the tar pits, as a sabre-toothed cat (Smilodon) attacks an already entrapped giant ground sloth, Paramylodon (artist: Mauricio Anton). 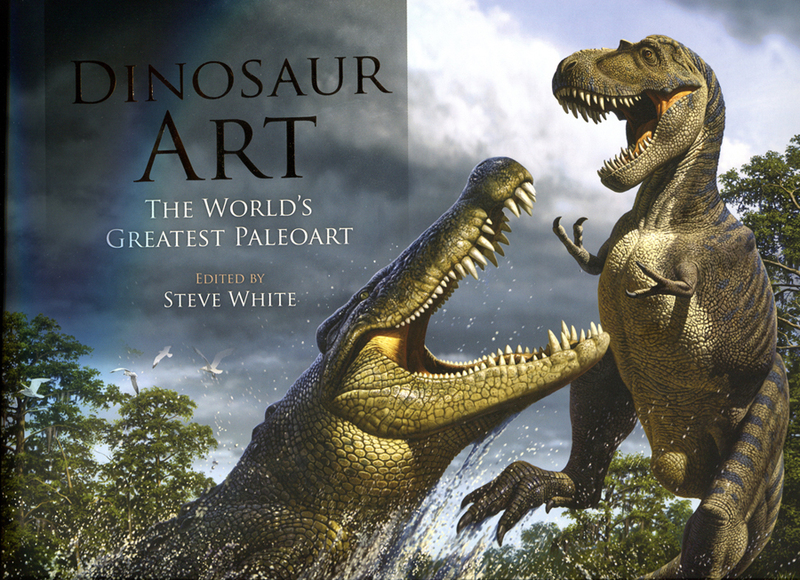 The title Dinosaur Art is a wee bit misleading, although it will help sell the book. Granted the bulk of the art is of dinosaurs, but there are many other fossil vertebrates featured, ranging from Paleozoic amphibians to Pliocene hominids. Maruricio Anton, one of the artists, specializes just in rendering fossil mammals and Cenozoic environments. The book focuses solely on two dimensional art, so no sculptures are shown. Towering nearly 15 feet tall, the aptly named Gigantoraptor, both toothless and feathered, struts its stuff in the Cretaceous of Asia (artist: Raul Martin). The crocodilian Pristachampsus runs down two early horses (Hyracotherium) (artist: John Sibbick). In this post I have reproduced one piece from each artist, to give you a sense of the book’s beauty and the range of fossil vertebrates illustrated. It was difficult to pick just one, as there are many illustrations for each artist. If you find these interesting or enjoyable, get a copy of this book. You will not be disappointed. You will be amazed and enthralled. Two giant pterosaurs (Quetzalcoatlus northropi) exchange insults with a juvenile T. rex (artist: Greg Paul). While I’ve never seen an organism I would call ugly, some are certainly more pleasing to the eyes than others and among the most beautiful of all are jellyfish. I recently visited the Monterey Peninsula in California and had the opportunity to spend a day in the Monterey Bay Aquarium, as spectacular an array of living exhibits of sea life as one might ever hope to see. 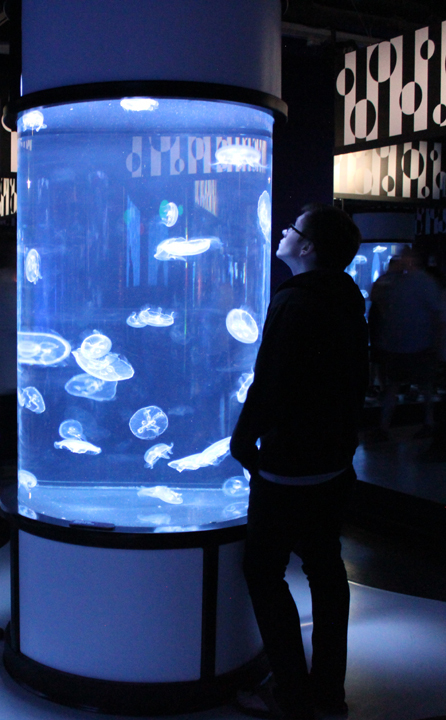 I was particularly intrigued by the extensive exhibits of living jellyfish. These diaphanous, almost otherworldly, creatures, are mesmerizing to watch as they gently drift and pulsate in their large tanks. Some are transparent and nearly invisible without the aquarium lighting while others are opaque or even somewhat brightly colored. Unidentified jelly, Monterey Bay Aquarium. 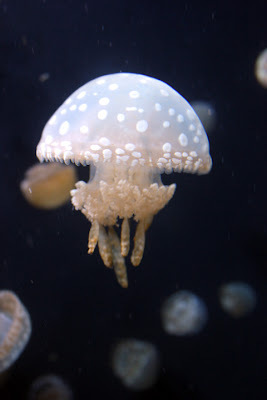 White spotted jelly (Phyllorhiza punctata), Monterey Bay Aquarium. It was exciting to see many hundreds of jellies while kayaking in the opaque waters of the kelp forest at Monterey. However, watching them in large exhibit tanks where currents, water filtration, and lighting are controlled allow you to a more intimate, close up, and more dramatic view. Crown jellyfish, Monterey Bay Aquarium. 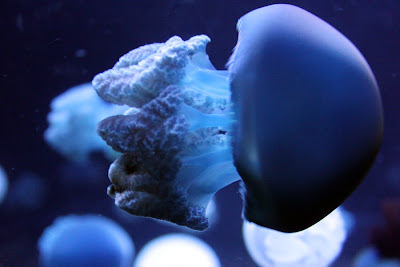 These are among the most popular attractions, which is a good thing because maintaining a collection of jellies is a complex and expensive proposition. 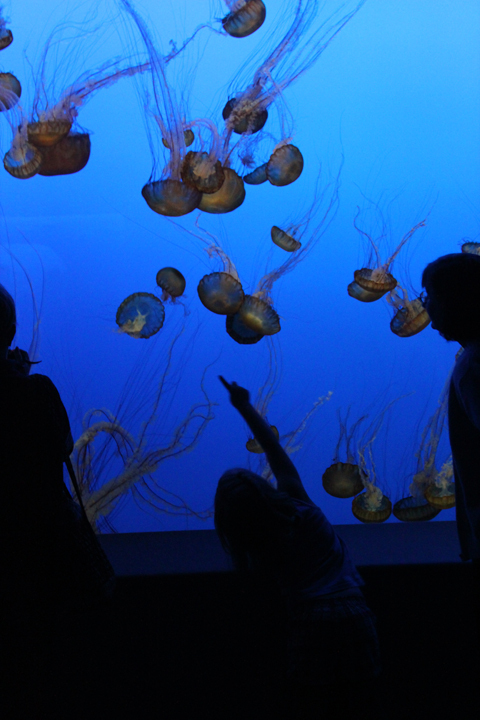 Pacific sea nettles spark the imagination and wonder of a future marine biologist at Monterey Bay Aquarium. Although primitive, jellies were likely the first group of multicelluar organisms to achieve movement through muscular activity. First appearing in the Cambrian, some 500+ million years ago, jellies are a very successful group and an important component of modern marine ecosystems. They are universally carnivorous, feeding on a wide range of organisms, from small invertebrates to boney fish, with some species specializing in feeding on other jellies. Jellies have exploited an amazing range of environments, from cold arctic oceans to warm tropical seas and from sunny, surface waters to the abyss, 25,000+ feet deep with frigid cold, immense pressure, and eternal darkness. There are even freshwater species. 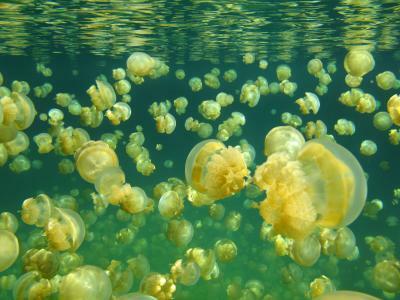 A swarm of golden jellyfish, Mastigias cf. papua etpisoni in the freswater lake of Palau. The crown or helmet jellyfish (Periphylla periphylla) inhabits ocean depths down to 7,000 meters (23,000 feet)! The smallest jelly, the Irukandji, is a mere 5 millimetres (0.20 in) wide, with tentacle close to 1 meter in length. The lion’s mane (Cyanea capillata), on the other hand, reaches a body diameter of 2.29 m (7 feet 6 inches) with tentacles 37 m (120 feet) long. 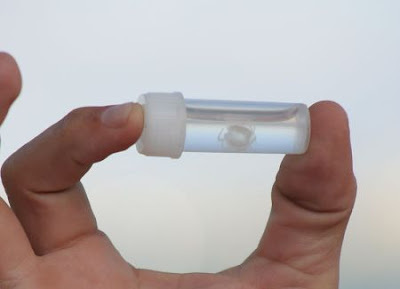 The Irukandji (Malo kingi) is both the smallest and deadliest jellyfish. 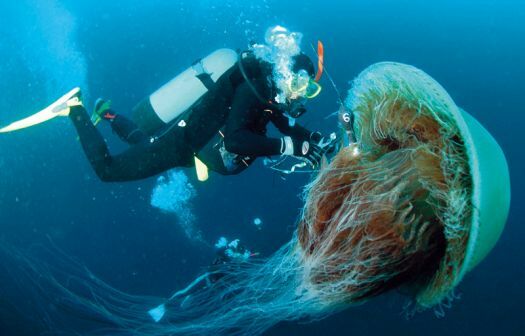 Cyanea capillata, the lion's mane is the largest known jellyfish and inhabits cold waters. Remarkably, jellyfish have diversified and survived with a very primitive body plan. The umbrella shaped body, or bell, pulsates for locomotion while the long trailing tentacles bear stinging sells for capturing and killing prey. Jellies lack a centralized brain, instead having a diffuse network of nerves running across their epidermis. However, their behavioral responses to tides, currents, other jellies (friendly and predatory), daily vertical and horizontal migration, navigation, etc. suggest that this is due to more than just simple reflexes. There is certainly some coordination of stimulus and response within the nervous system. Jellies don’t need gills or a respiratory system because they absorb oxygen directly through the body wall. They also lack a circulatory system. The mass of the bell is composed of a non-living jelly-like substance, the mesoglea, sandwiched between two layers of skin, each only one or a few cells thick. To top it off, they are 99% water! Most jellies have light sensitive organs around the margin of their bells that can discern patterns of light and dark but little detail. Yet in spite of this simplicity and apparent fragility, jellyfish have weathered the five great mass extinctions in the history of life on Earth and continue to flourish and survive. 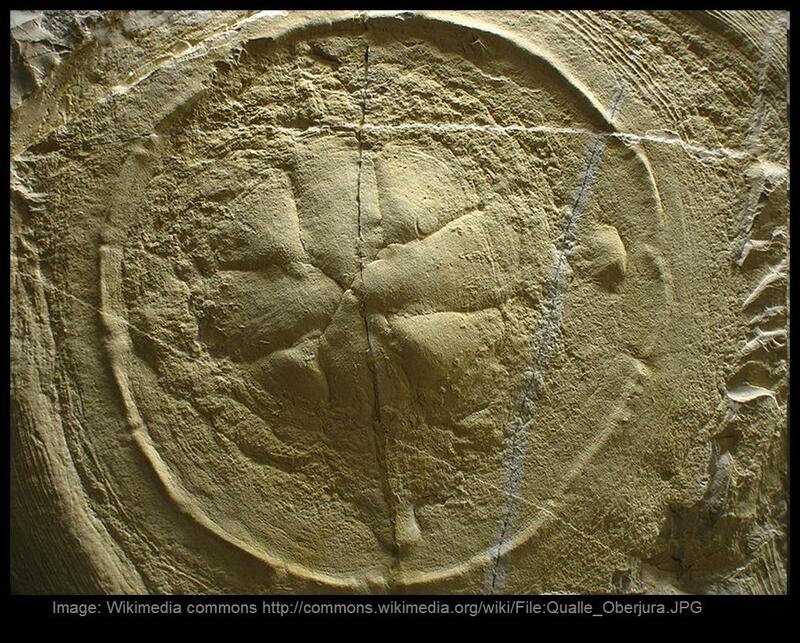 Rhizostomites admirandus, a large, late Jurassic jellyfish fossil from the Solnhofen Limestone. Often, while I am looking at living organisms several questions come to mind. What are these things related to? How far back in time does this group go? What is their fossil record like? In the case of jellies, which lack any hard parts and seem to be composed of almost nothing, the fossil record question seems particularly intriguing. Given that jellies are, well gelatinous, they would seem to have little chance of being fossilized. A quick glance of the scientific literature might give the impression that many fossil jellies have, in fact, been discovered, going back into the latter part of the 19th century. However, more recent analyses with a more critical eye have shown that many of these circular and/or domed fossils have other origins. A wide range of things have been identified as fossil jellies, such as trace fossils of marine invertebrates (like infilled feeding and dwelling burrows of worms and crustaceans), fossil algae, and sedimentary structures of inorganic origin(such as sediment disruption from ancient releases of gases), concretions, sand volcanoes, evaporite pseudomorphs, etc. The supposed jellyfish Laotira cambria ultimately turned out to be fossilized, infilled burrows of ancient marine invertebrates. 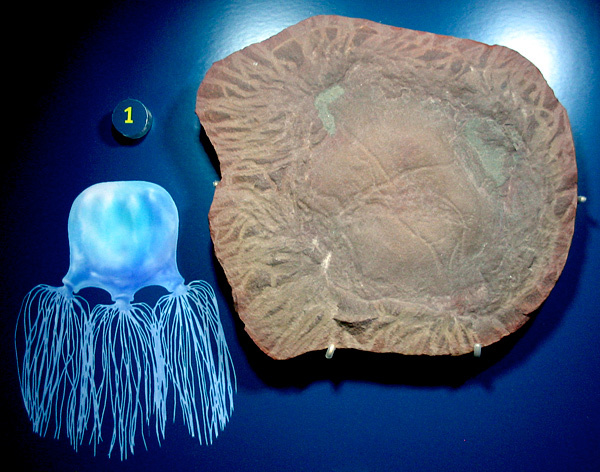 Sometimes the jelly is really the partial remains of other kinds of animals, such as Peytoia, the Cambrian jellyfish (below left) that turned out to be the peculiar circular mouthparts of the giant marine arthropod Anomalocaris (below right), the 2 meter predatory terror of the Cambrian seas. Nevertheless, there are still some fossils that are bonafide jellies. 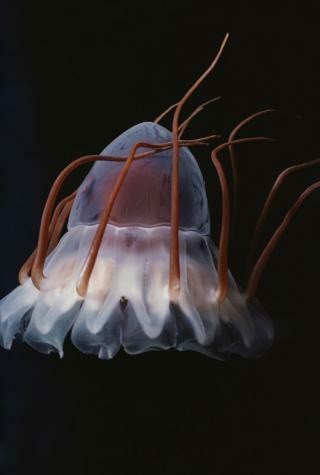 The record is sparse, no more than nine jelly bearing rock units can be identified with certainty (Young and Hagadorn 2010). Some of these rock units may be the same unit, but are physically separated and not continuous, which means that distinct jelly bearing rock units may well be less than nine. In many cases the units have yielded less than 30 specimens in total. “This is a shockingly small fossil record for groups with such importance in modern seas (Young and Hagadorn 2010). The beautiful, graceful jelly bell-shape in the ocean often transforms into an amorphous gelatinous blob once it washes onshore. 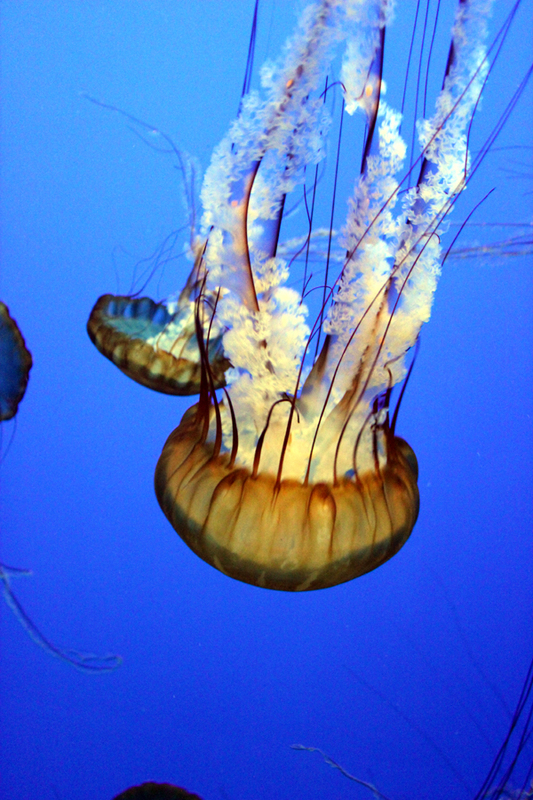 Tentacles are delicate and are the first parts of a jelly to disappear as decomposition proceeds. The mesoglea rapidly dehydrates when out of water so the bell may become distorted or shriveled on the beach. So recognizing a fossil jelly (and being able to differentiate it from other kinds of fossils and sedimentary structures) can be a difficult undertaking, often requiring the careful study of multiple specimens and considerably more detective work than, say, recognizing a bone is from a dinosaur. 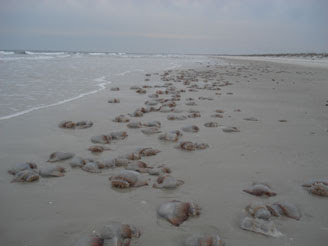 A modern swarm of jellies stranded on the beach by a retreating tide. 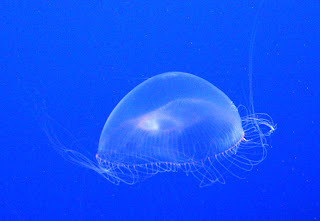 Jellies occur in enormous numbers under the right conditions in right environment. These swarms sometimes come in with the tides and are stranded on the beach when the sea retreats. As they continue to pump their bells in an attempt to escape, they often fill their stomach and other internal cavities with sand. Similar ancient strandings can produce spectacular fossil concentrations. In Wisconsin and New York on ripple marked intertidal beds of Cambrian age (more than 510,000,000 years old), have produced tens of thousands of jellyfish fossils. A fossilized swarm of stranded jellyfish from the Cambrian of Wisconsin. 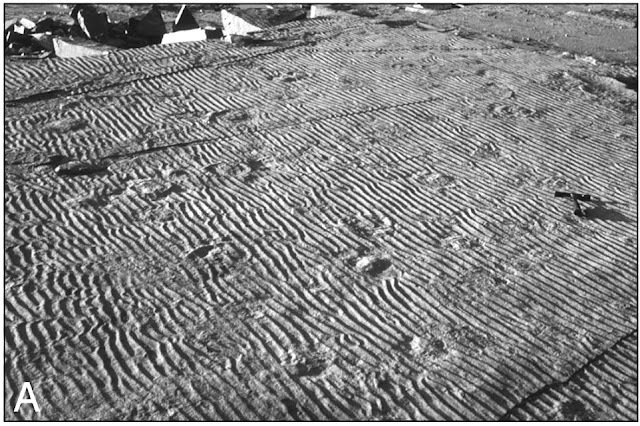 A: rippled beach sand with numerous jellyfish impressions. D, E, F closeup of individual jelly fossils. Interestingly, there are no mass strandings of jellies known in the fossil record after the Cambrian period. This absence is not because jellies no longer occurred in mass groups, we know they continued to do so right up to the present. Rather this peculiar record is the result of other biological factors. 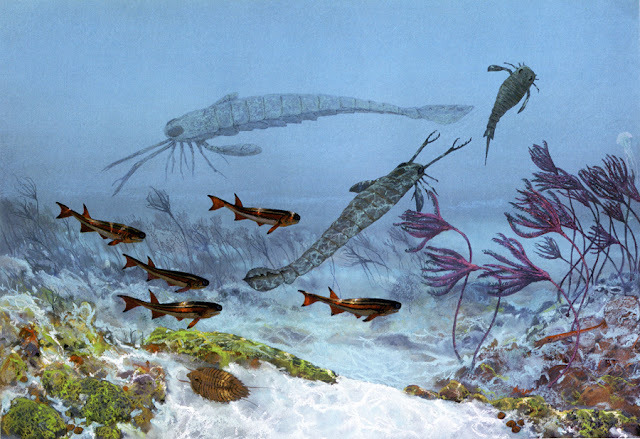 During the Cambrian ALL life was in the oceans. There was no plant or animal life on land. I don’t mean no reptiles or amphibians on land, I mean NO life on land. Hence there were no shoreline scavengers to feed on the dead jellies. 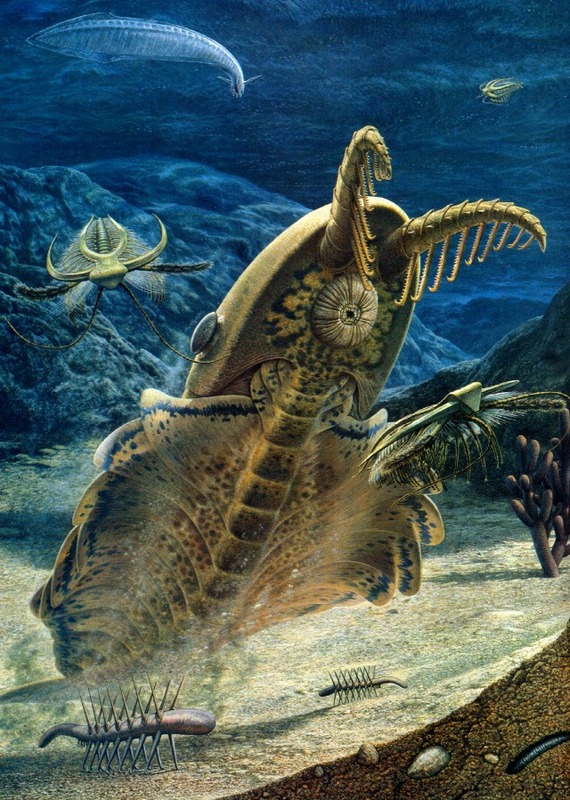 Furthermore, during the Cambrian organisms occupied only the surface of the sea floor --- no groups had yet evolved to burrow and feed within sea floor and beach sediments. So there were no invertebrate sediment dwellers to consume the jellies after they were buried. 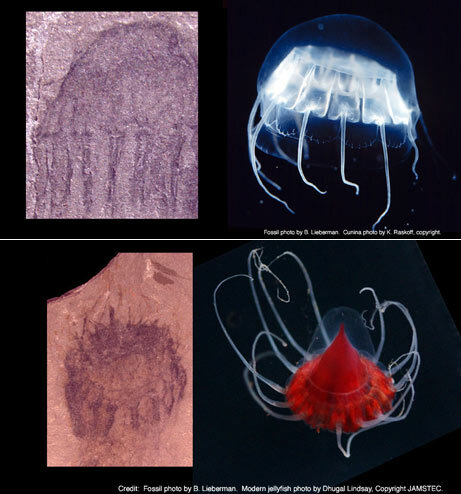 Jelly fossils are also known from other kinds of ocean environments. Cambrian subtidal deposits of the Marjum Formation have yielded exceptional jellies that, unlike the Wisconsn and New York localities, have soft anatomy, such as tentacles, muscles, and reproductive organs, clearly preserved. 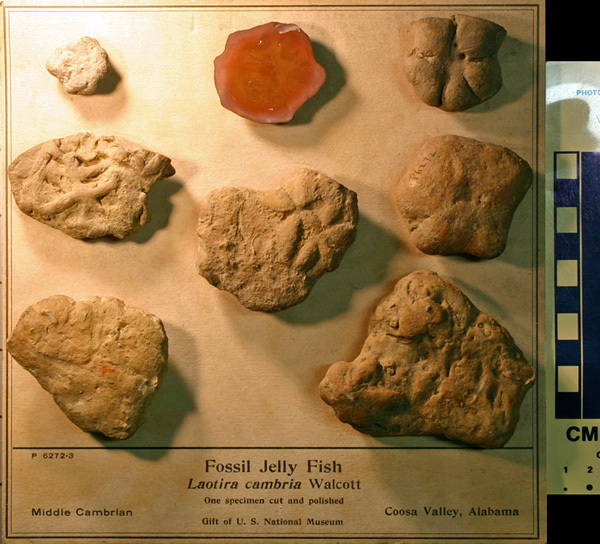 Unnamed fossil jellies (left) and living representatives of the groups each fossil belongs to, Marjum Formation, UT. The ironstone concretions of the Mazon Creek of Illinois, approximately 300 million years old, have yielded more than 35,000 specimens of jellyfish!!!. The fossil cubozoan jellyfish Anthracomedusa turnbulli, from Mazon Creek with a life restoration. The Late Jurassic Solnhofen limestone, most famous for producing skeletons of Archaeopteryx, the oldest bird, contains abundant large jellies, up to 50 cm in diameter. 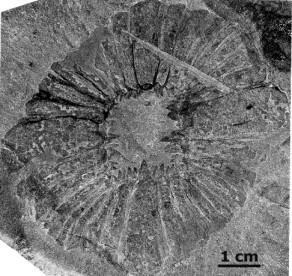 Like the Marjum, these fossils also show remarkable soft tissue preservation. Close up of Rhizostomites admirandus specimen above, showing impressions of circular muscles around the margin of the bell. The soft tissue preservation in the Marjum and Solnhofen are the result of peculiar bottom conditions in each ocean. The Marjum has anoxic bottom waters, meaning that the oxygen levels in the water were extremely low. In the Solnhofen the bottom waters were hypersaline. In each case, the result was that there were no scavenegers or bottom dwelling fauna to feed on or decompose the jelly carcasses after they sunk to the bottom. The Francis Creek jellies were preserved in the brackish waters of an estuary, where iron mineral formation around dead organisms preserved many soft body animals. Surprisingly, no unambiguous jelly fossils have been found in post-Jurassic rocks. 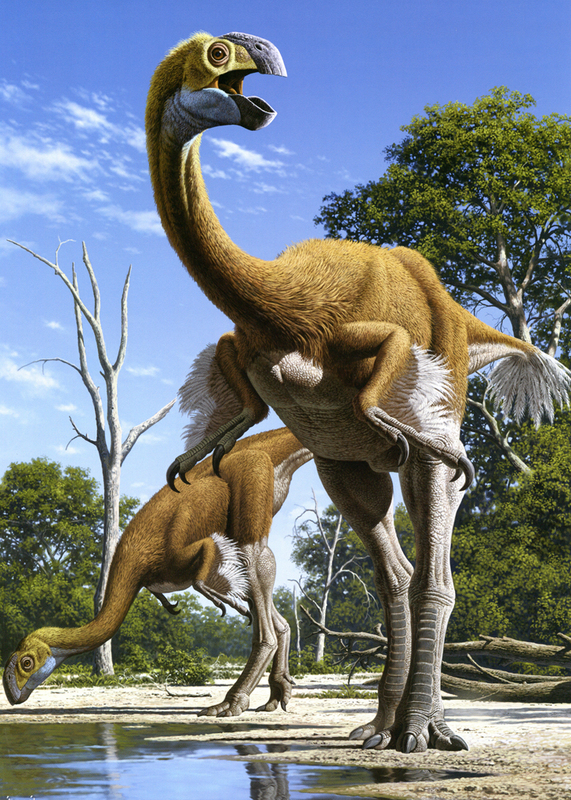 Although some have been reported closer study has revealed them to be feeding and dwelling trace fossils. 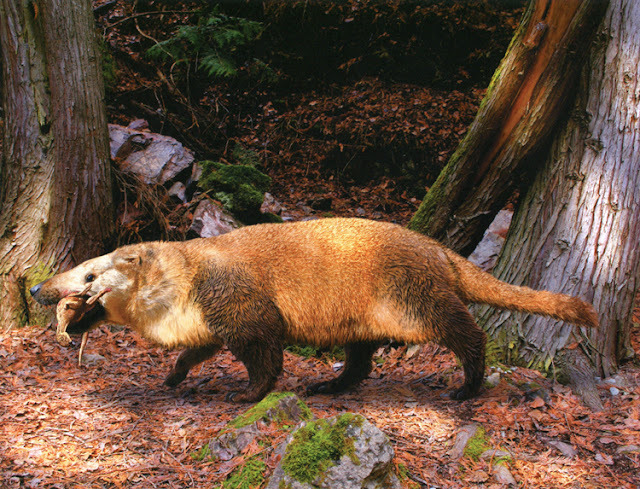 So for the last 150,000,000 years of Earth history there is no fossil record for these beautiful carnivores! Hopefully future discoveries will begin to lift the veil on this dark and unknown chapter of jelly evolution. 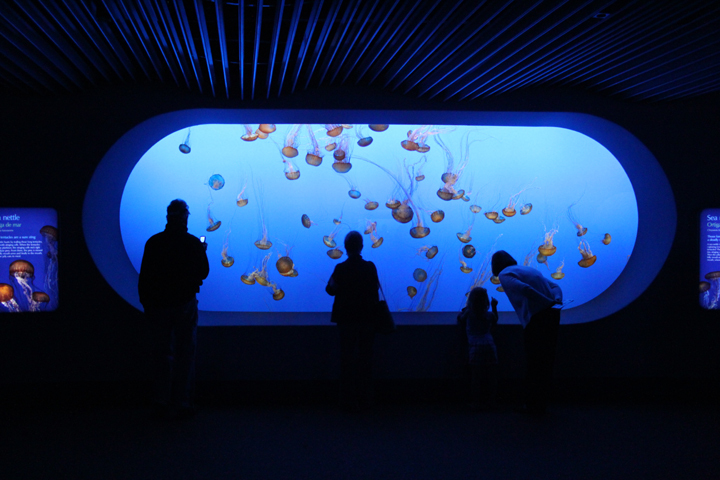 Pacific sea nettle tank, Monterey Bay Aquarium. I have used jelly and jellyfish interchangeably here and both in the popular sense. 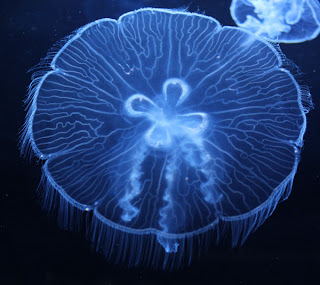 I am aware that true jellies are members of the class Scyphozoa, that hydromedusan jellies (including the Portugese Man of War ) are Class Hydrozoa, and cubozoan jellies are, well, Class Cubozoa. 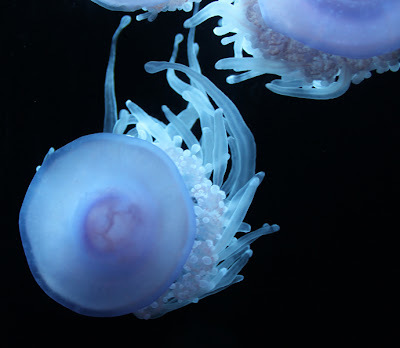 I’ve written about “jellies” in the sense that they are all medusae, i.e. umbrella shaped free swimming cnidarians, because most general followers of Land of the Dead would think of them as jellyfish. I haven’t included comb jellies in the discussion because they belong to an entirely different phylum of animals (Ctenophora) with only a distant relationship to the Cnidaria. Yes, most people would think of a comb jelly as a jellyfish, but that was just too much of a phylogenetic stretch for me. And yes, I know that jelly fish are not fish. Albert, D.J. 2011. What’s on the mind of a jellyfish? A review of behavioural observations on Aurelia sp. jellyfish. Neuroscience and Biobehavioral Review 35(3): 474-482. Garm, A., Oskarsson, M., and Nilsson, D.E. 2011. Box jellyfish use terrestrial visual cues for navigation. Current Biology 21(9): 798-803. Hagadorn, J.W. and Belt, E.S. 2008. Stranded in upstate New York: Cambrian scyphomedusae from the Potsdam Sandstone. Palaios 23: 424-441. Hagadon, J.W., Dott, R.H., and Damrow, D. 2002. Stranded on a Late Cambrian shoreline: medusae from central Wisconsin. Geology 3092): 147-150. Young, G.A. and Hagadorn, J.W. 2010. The fossil record of cnidarian medusae. Palaeoworld 19: 212-221. All photos in Monterey Bay Aquarium by the blogger. Hagadorn, J.W. and Belt, E.S. 2008 (see citation in Sources below).